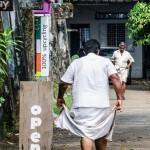 As I was walking along the bank in Fort Kochi area looking for some things to shop, a collective song rose over the cacophony of honking vehicles, and sales pitch of street vendors, engulfing me it its ” Hiya, Ho, Hiya Ho “. I could not understand a word of the song but it was almost like a war cry from men with calloused hands, sweaty shirts and chest and arms chiseled by working on the nets every single day. These fishermen had never seen the inside of a gym but could easily pose for Michael Angelo for one of his masterpiece, showcasing human masculinity. The Haunting song made me stop and look at what the fishermen were doing. 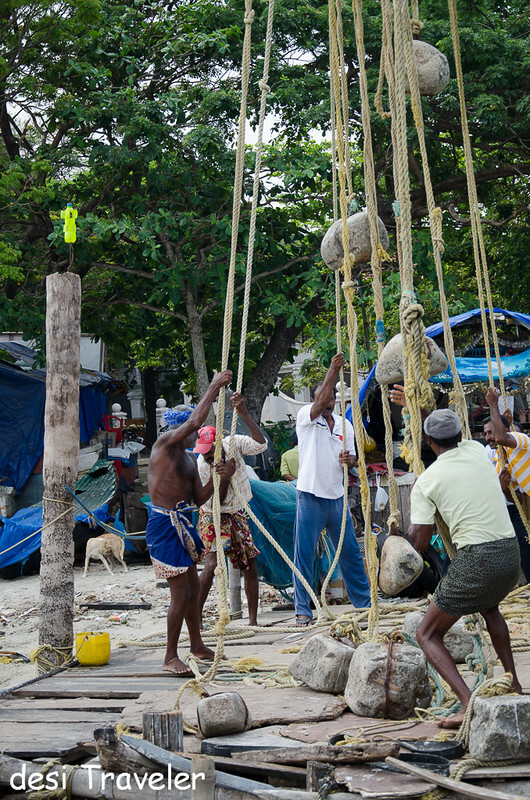 A couple of guys will climb the slender logs used to lower the nets in water using their body weight. Then they will climb back and join their colleagues singing ” Hiya Ho, Hiya ho“, as they pulled the nets out of the water. Not an easy task looking at the pearls of sweat formed on their forehead. I saw the exercise 5 times and twice the net yielded almost nothing. So they did everything again hoping that this time the bountiful Arabian Sea will fill their nets. They did not catch fish every time but they did catch the attention of onlookers every time they broke into a chorus. 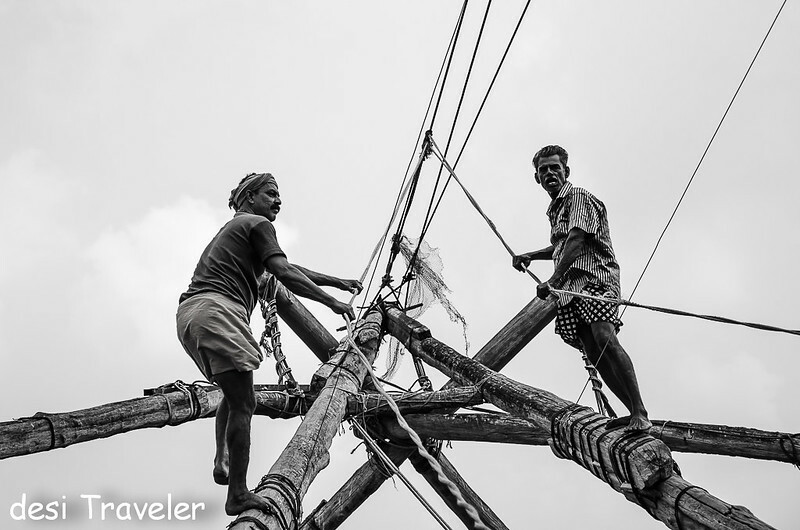 The poles that hold the nets and life of the fishermen climbing them will never win any prize for beauty or structural engineering, and look scary with multiple poles joined together using some strings and wire, a typical desi Jugaad kind of job. But the fishermen were climbing them like you and I will climb stairs, may be better than me as I prefer to take the elevator when available. The Chinese fishing nets look pretty mundane and oversized laundry hanging on the poles in the day. The harsh tropical light makes it tough to click them and I converted some of the day pictures of the fishing nets to Black and White. You see the challenge is when they were invented the idea was to catch fish and not the golden orb before it takes a dip into the Ocean in evening. 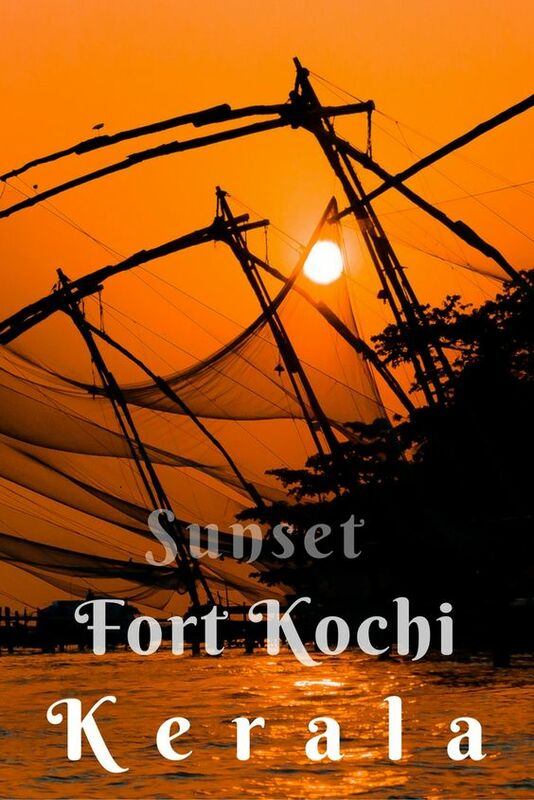 But as the Sun starts to get ready for his evening plunge, the sky changes color faster than a chameleon, the Chinese fishing nets show their true color for which the photographers like me consider Fort Kochi an ideal place to click a sunset (and hereby I declare myself A Photographer, Narcissus would be so proud of me! ). A lot of things happen in the golden hour as you prepare for clicking the pictures of sunset behind the Chinese Fishing nets. As the fishermen get ready to go home, the birds start coming to spend a night on the nets. The nets that were squeezing the life out of the sea during the day become the home to another life for the night. The another challenge is everybody else around you is also a photographer and some of them damn good at their job. So everybody is looking for the best angle to click Sunset over Chinese fishing nets. 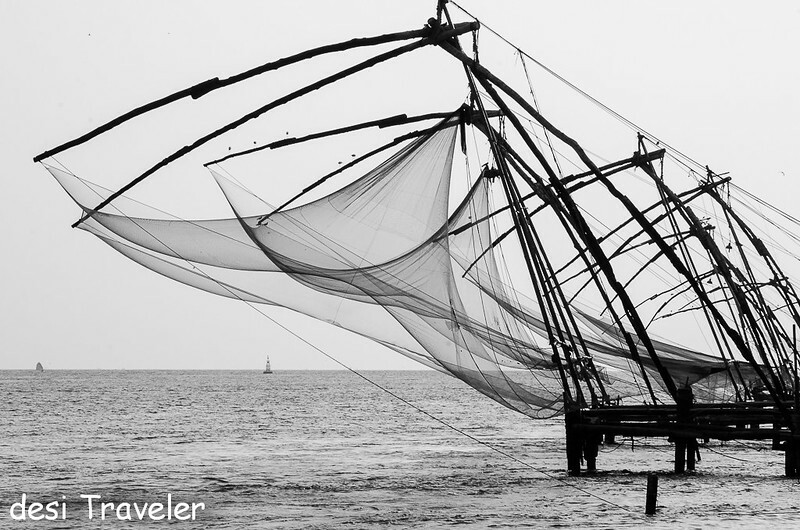 Now here is a little secret that I learned only after visiting Fort Kochi, the tourist side where all the shops and few fishing nets and market is situated is not the best place to click sunset as your view is hindered by people, lights coming from shops and the very fact that you are on the land and very close to the nets with wires, poles etc. obstructing your view. 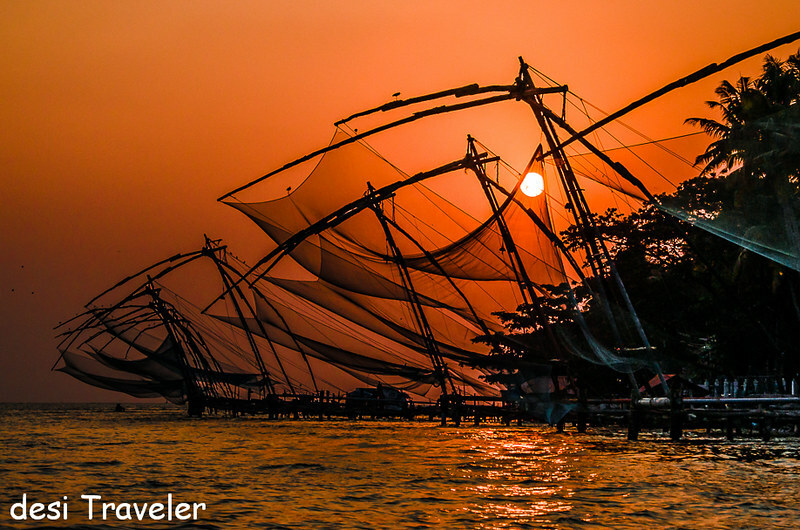 So the best vantage point to take pictures of Sunset over Chinese fishing nets in Fort Kochi is to take a boat and visit the other side of the harbor and click to your heart’s desire or the capacity of your memory card. Again you will be competing with tens of boats and some will have engines bigger than yours, so be early and enjoy as the horizon changes color and sun melts and vanishes into the sea. A few points to remember are: Carry a wide angle or kit lens, protect your gear from sea water as water splashes around you. Also, remember to be careful with framing and composition as the boat rises and falls with the waves your composition will change every second even if you have not moved so be agile and keep an eye on your viewfinder. In the end, everybody seems to be happy the fishermen caught some fish, the photographers caught some Sun in the net. Sunset Pictures in this post were clicked using Nikon D7000 Camera and, 18-105 VR Kit Lens. F stop used was 11 and above depending on the intensity of the sun and they were processed in Lightroom and are optimized for web viewing. Saved the best for last. Incredible shots! Lovely pics. Nice of you to share your vantage point – many don’t do that. 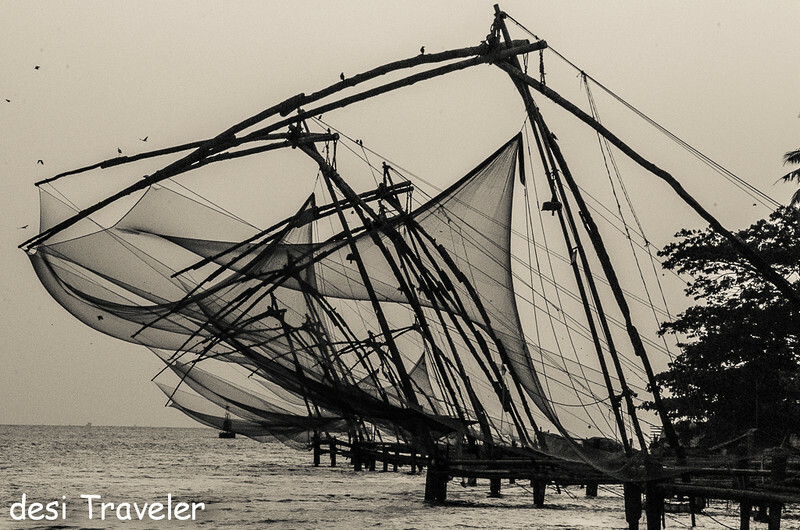 I had been to Cochin with family, but didn’t get time to click any pics so it was good to see it through your lens. Keep going! Thanks Vibha….glad that you liked the pics…. It is hard to shoot objects that have been shot to death. Yet, you have done it with panache. They are all well-framed and controlled, my favourite is the one captioned “The Magic Begins once Sun starts to melt away in Arabian Sea”. Thanks for the encouragement Umashankar jee..
That is a nice handy tip on where to click the pictures! I didn’t know that when I was there. Loved the pictures. Amazing pictures of sunset ! Your series of photos is so stunning and amazing! The sunset … dreamlike! Such a wonderful post! Simply gorgeous — those sunset shots. And the black and white ones are classic too. What I especially loved about the post was that you not only captured the sunset but captured the tenacious work of the fishermen too! 🙂 Awesome pictures (as always! ), complemented with beautiful narration and useful tips, loved it. The first photo (fisherman) and the last photo (Sun set) I like the most. Thanks for sharing. 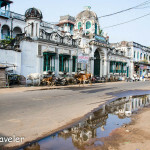 I have heard so much about Cochin but never been there. 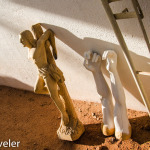 These photos are great. Beautiful. 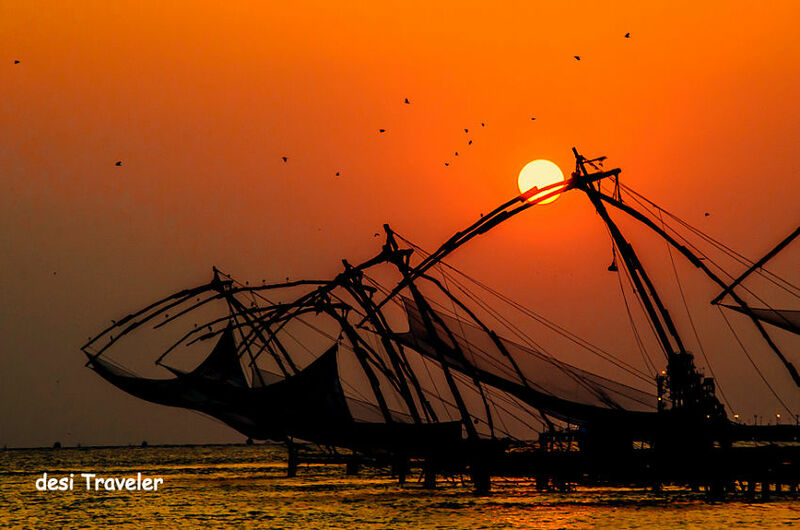 Can never get tired of seeing the sun set over the fishing nets of Kochi! 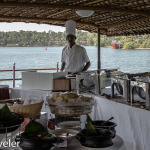 Oh wow Prasad – I so have to visit Kerala! 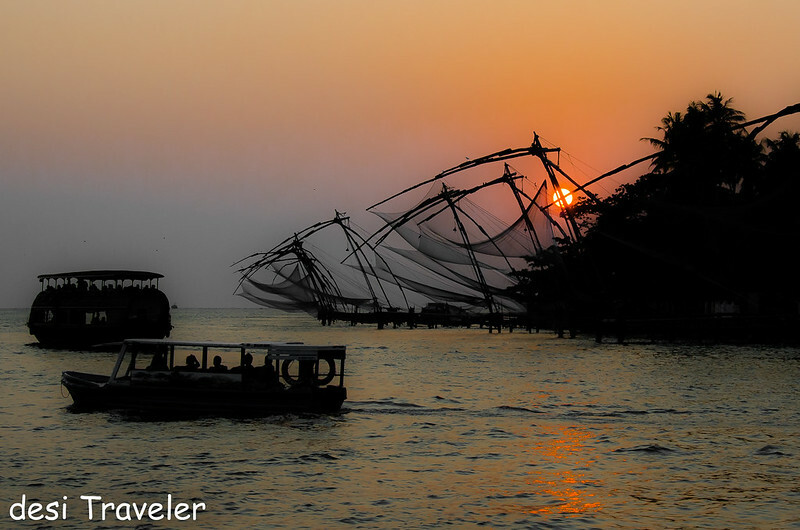 Love the pics with fishing net in sunset!! Thanks a lot Eli… one more reason to visit Kerala …. Beautiful photos… I personally really like the black and whites ones… thanks for the tips. Shall keep them in mind. Wow! So beautiful and interesting! Thanks you for sharing! Spectacular series of photos and fascinating information too in this post. 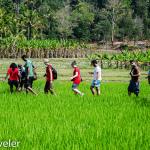 Kerala almost seems like an alternative world in India. My Travel Wishlist for Beautiful Oman So Where is Denwa Backwater Escape Resort ?